To mark the end of the year-long celebration of the 150th birth anniversary of national hero Jose Rizal, Ballet Philippines will be performing its original award-winning dance production, "Crisostomo Ibarra", on June 16-17 and 23-24, 2012 at the CCP Little Theater. Special Gala shows will be performed with live music, featuring 5 leading classical musicians. "Crisostomo Ibarra" will also be performed at SM Calamba on June 18. Ballet Philippines has performed "Crisostomo Ibarra" in Singapore and key cities and venues around the country. It kicked off its national tour at the birthplace and on the birthdate of Rizal at SM Calamba, and toured all over the Philippines including Vigan, Dumaguete, and Bacolod, among others. 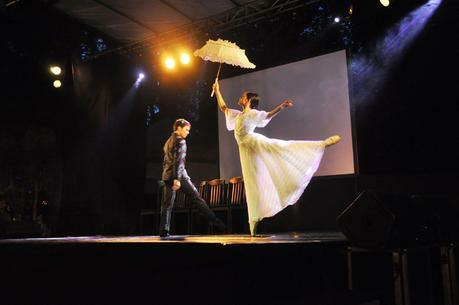 "Crisostomo Ibarra", choreographed by Ballet Philippines’ artistic director Paul Alexander Morales, won Outstanding Dance Production at the 2010 PHILSTAGE Gawad Buhay awards, as well as three other awards for its dancers. The contemporary ballet depicts Crisostomo Ibarra’s transformation from aristocratic idealist to revolutionary pragmatist. Ibarra’s internal journey begins on his travel back home, where he metaphorically resists the strong tides that sway his co-passengers. Rizal’s narrative is rich and nuanced, and the ballet focuses on the vignettes of the novel that focus on Ibarra. With music by Jed Balsamo, and sets and costumes by Jose Melencio, the ballet does a fine job at depicting the period in which it was set. It is also helped along by videos by filmmaker Ruelo Lozendo, a testament to the multi-media inclination and collaborative nature of BP’s Morales, who is also a theater director and filmmaker. "Crisostomo Ibarra" runs on June 16, 17, 23 and 24 at 2 p.m. (matinees), and June 16 and 23 at 6 p.m. (evening shows, with live music) at the CCP Little Theater. Tickets are P600 for matinees and P1000 for evening shows. There will also be a performance at SM Calamba on June 18 at 4 p.m.--free admission, courtesy of the City of Calamba and Mayor Jun Chipeco. For more details, call Ballet Philippines 5511003 or visit www.ballet.ph.